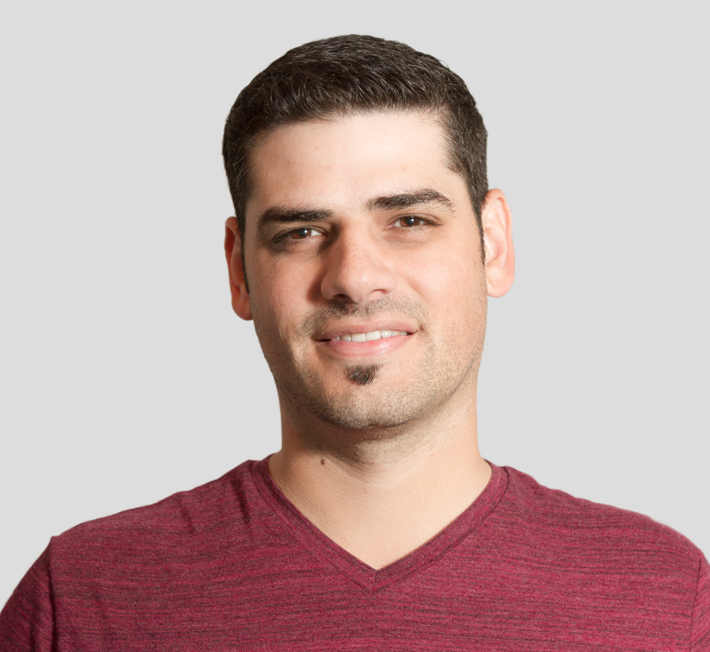 The following is a transcript from our webinar with Kyle Gilbert of Phoenix Arizona digital agency Kitchen Sink Studios. 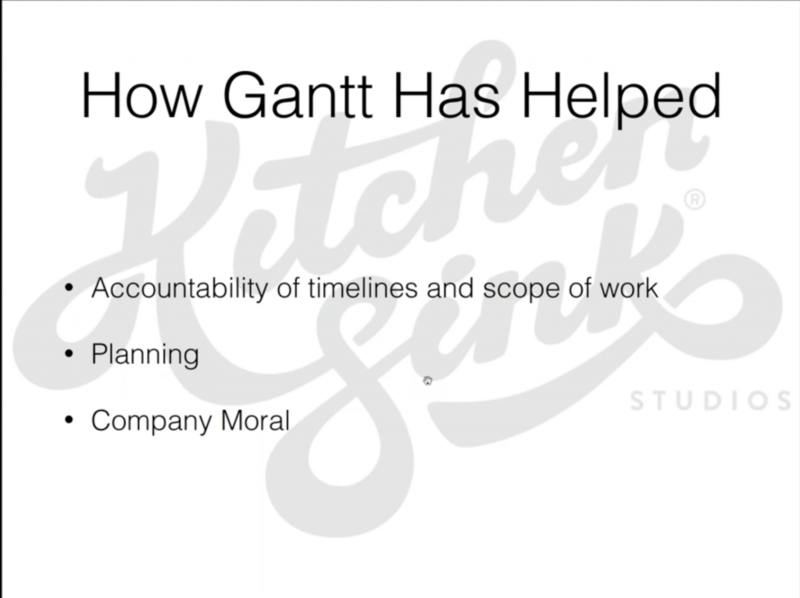 In this webinar Kyle explains how they use TeamGantt project management software to finish their projects on time and on budget. My name is Kyle Gilbert. 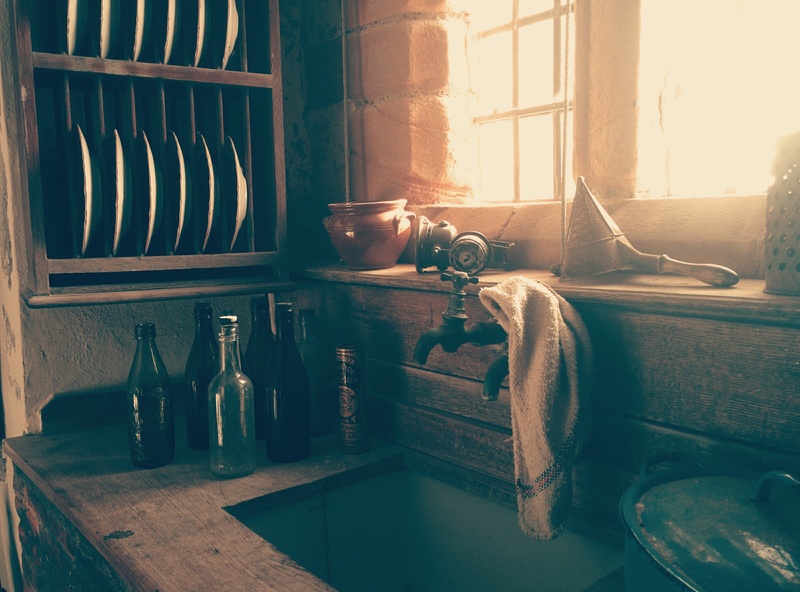 I'm currently serving as production manager at Kitchen Sink Studios. Basically I am the project manager for the entire agency, as well as serving as a production manager for the film team, and making sure all our film projects go smoothly. I use TeamGantt on a daily basis to set out all our projects and keep track of their work flow. So today, I'm going to give you a little bit of insight more on the project manager side of things and show you how I use TeamGantt and its benefits. Kitchen Sink Studios is a creative and design consultancy in downtown Phoenix. We call ourselves Kitchen Sink Studios because we offer everything from branding, print design, web design, development, renderings, animation, illustration, copywriting, photography, film, and social media. Currently, we do everything in-house with dedicated teams for each service. TeamGantt is a perfect platform for us, because all of these different sections of the business work at their own pace. 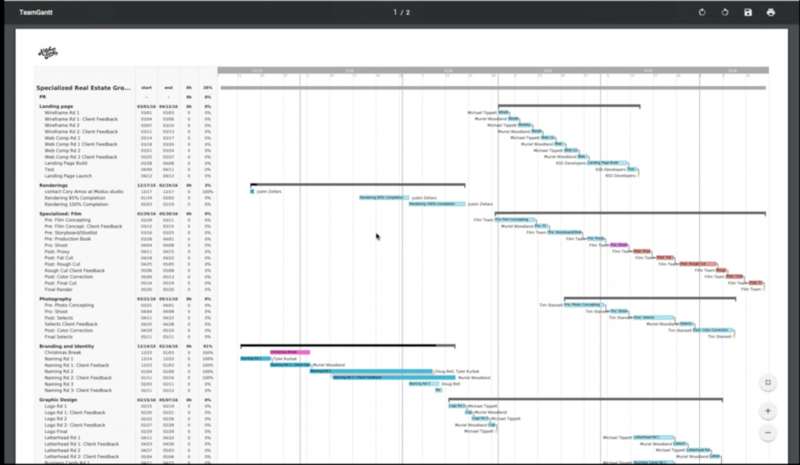 Therefore, the timeline feature of TeamGantt is extremely crucial to see how those projects relate to each other and how they overlap in the scope for a client. We’ve been a customer of TeamGantt for about three years now. We've been extremely happy with the results, both on our end and we’ve seen extreme happiness from our clients and the way that we share our project plans with them. Being able to visualize our project in a timeline is extremely important. As you can see in the shot below, I've created sections for each part of the business. So, we have a web development section, a film section, photography, branding and identity, graphic design, and then even a little bit of account management. Basically what I will do is I will set out a Gantt chart for the entire scope. And this lets me see how each of these sections of the business relate to each other. And it's a perfect visualization of these timelines, to see how many weeks they span over and where different parts of the scope are overlapping. Say a graphic designer is delivering a graphic element to the film team, they can go into the Gantt chart and the film team can see when that graphic is supposed to be coming from the graphic design team. So it helps both for me and for all of our employees to visualize when they're getting stuff done, how many days they have to work on it, and what other departments and tasks are dependent on them. More on that later. Another thing I really like about TeamGantt is it gives me a quick judgment of capacity. The question I get most from business development people is "when can we get a project in?". What I can do when the account manager comes to me, and they ask me–"How busy we are on the web development side in March?". I can look at my gantt chart and look to the development group to see how many hours or tasks they have on any given day, week or month. This color coded synopsis is great, I can see me exactly what they're working on. The more red a box is on any given day the more busy they are. So, if the account manager came to me today and asked me when we could take on some development work, I would gauge by clicking on one of these boxes. I would see how long I think those tasks are going to take them and depending on how big of a project is, I may move–tell them that we might want to consider waiting until mid April to bring on another development project. At Kitchen Sink, we believe in transparency. 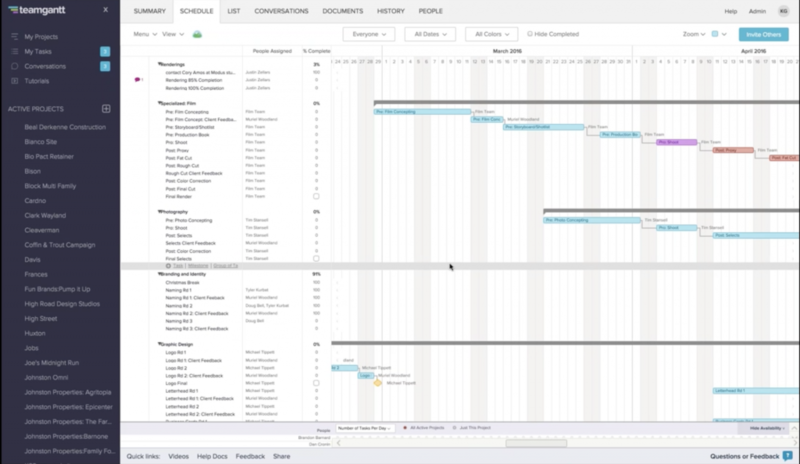 We always are completely transparent and share our gantt charts with our clients so they can be a part of the project team. What I will typically do is after I've set out a scope like this in TeamGantt, I will typically export a PDF. TeamGantt asks me what paper size I want, how I want to show the date and what resources I want to display. The PDF export is very visually appealing and professional looking. I send this PDF over to the client as their version of the scope of the project, so they know when they can expect things on their end. I will also share client feedback due dates in TeamGantt. I find this effective because on of the largest variables that can throw a project off track is always client feedback. You should build that in, in order to account for those days that your clients need to review things. It also helps bring your clients in on projects by giving them due dates in the project so you're holding them accountable as well. So if a client doesn't deliver feedback on Sunday, I can push the whole timeline over to Tuesday. Now the client knows that this timeline has been pushed back that far because their part was late. Typically this open transparency helps and clients really appreciate it. 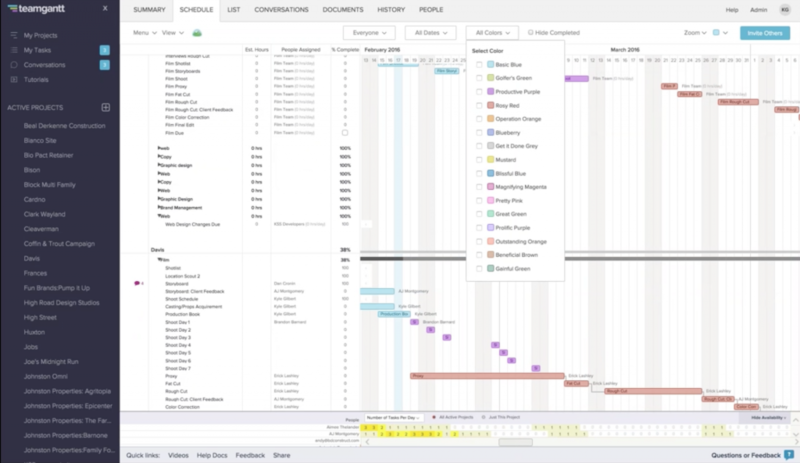 Before TeamGantt, we had tried other project management software, and they were great for managing tasks and seeing when things were due. But people really never knew when they were supposed to start on tasks, how many days they had to complete the task, and what other projects or tasks were dependent on them finishing their tasks. We were using things like email to send back and forth due dates. We were using Excel spreadsheets to keep track of projects. We would hold a weekly meeting called "picket fence", where we would basically talk about what departments had what going on in the week. So you guys can see that before TeamGantt, we were using three separate tools to keep track of projects. And it really just didn't work well and became messy very quickly. TeamGantt has really improved our process because it is great for accountability of timelines and scope of work, on our end and on the client's end. One thing I always do with all my creatives when I set out a timeline is I make sure that they are OK with the amount of time I have set out. Once I get that verbal approval, they know and I know that they are accountable. And they can get that work done in time. TeamGantt is also great for planning. 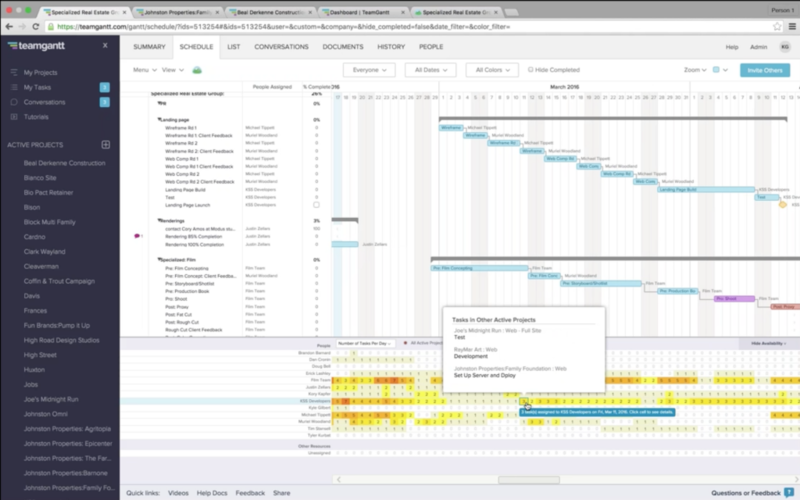 The tool lets you view multiple projects in one gantt view. The reason this is great for planning is I can see where we have shoot dates, where we are doing pre-production for shoots, and where we are in post-production. If a account manager comes up to me and asks me about if I can take on a film project, I can quickly pull everything up and tell them where we can take in projects and where we can't. Also, I've noticed that as we use TeamGantt, and we use it on a regular basis, and we keep up with managing it, it allows for better company morale. The reason being is everyone knows what they're accountable for. They can go into their gantt screen every day, and they see their tasks and their progress on them. And then they have me hounding them for projects every single day. And they know what they can work on, and come in and just get to work right away. One way we use Gantt in a creative way is for our accounting. We are a creative agency and our scope usually gets paid within a couple installments throughout the project. So our partners will set up a gantt chart for accountants. What that tells the accountant is what days they need to send out the invoice for the client, how many days that client has to bill, and when the check should be coming in. There's also a great comment feature we use to have conversations back and forth between the accountant and the client. Once we create a plan for a project, I will actually pull in all the creatives working on the projects and we have a gantt kick-off. This way if there's any issues with the creative thinking that maybe they can't get this logo done in a week, or maybe the account manager thinks the client is going to take longer than two days to give us feedback, we can adjust those timelines. From there we all go off and start on our part of the project. Everyone is accountable from that point forward, because they've given us their word and they have been part of setting those timelines. Also, I encourage everyone on TeamGantt to have it open on their screen all day. This encourages them to go back sure they're not missing anything, and to see anything new that may pop up during the day. Also, I would recommend to appoint one person to manage the software. The beauty of TeamGantt is it's very collaborative, but here at our studio I am the only one that is in charge of Gantt. Therefore, if timelines get moved, it's only by my hand, and I know exactly why. One great filter to make it a little easier on the eyes, is the ability to assign colors to tasks, then search by color. Using this I can quickly filter to see only our whole post-production schedule. It condenses it a little bit more and makes it a little easier on the eyes. You can also filter by team member. For example, Michael is one of our graphic designers here at Kitchen Sink Studios and if I just want to see everything Michael's working on, I can go up here and see everything that's been assigned to him. This pulls up a quick synopsis for this scope of what Michael's working on and where he should be at. Another filter option is to see when things are due. So you have a lot of options here when things are starting, when things are due, what things are overdue. So you can go to "due today" and it will bring up the tasks that are due today. I showed you guys this film section where I have multiple projects open. And this is a really, really great feature just for seeing things side by side and judging certain projects based on what kind of work goes into them. I will do this with graphic design, film, web design, anything that similar projects are using the same team for. This way I can judge how busy they are and I don't have to pull up all my projects. TeamGantt is very visual and easy to use. It's very satisfying seeing your projects laid out and there's a certain comfort level with that. Everything is really easy to move, very responsive.